He was an experiment of sorts. A test for a nearly-newlywed couple to measure their aptitude at raising and nurturing another living being that wasn’t a houseplant. He was a rescue kitten. An ad in the paper – because in those days, fancy things like websites were still taking baby steps across the Internets – and a voicemail led to a stop along our way home from an out of town wedding to visit his foster home. Tiny enough to look like a healthy-sized dust bunny from a distance, he made a habit of finding the smallest container he could to fit into. He fit our hearts, and our home, perfectly. A little kitten with big ears. He came when called, didn’t mind getting wet, would play fetch, watch us with a sad expression on his face from the upstairs window as we left for work in the morning. He hated any uniformed delivery agent who approached the house, which he announced with a fierce growl before fleeing to the highest level of the house he could get into. He was very dog-like for a cat. 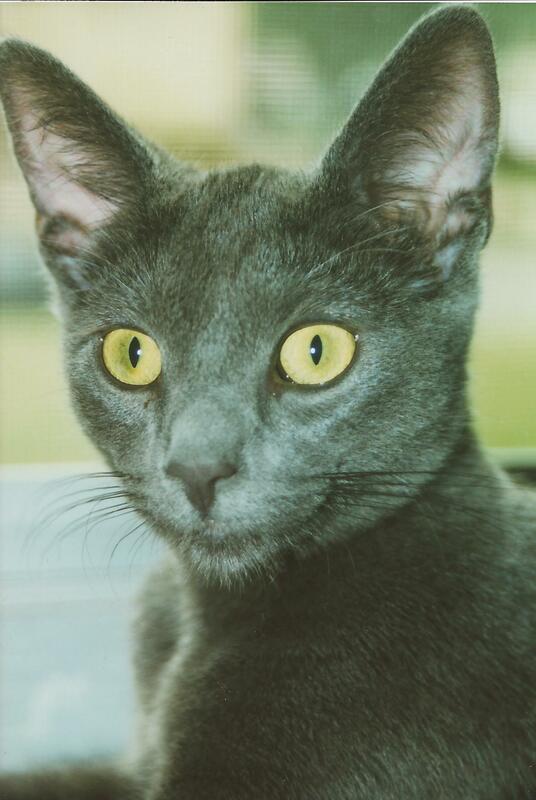 We took to calling him “little buckaroo,” even though his name was meant to reflect his breed: a Russian Blue cat named Koshka. And you wonder why kids were a long time coming for us? In older, yet much healthier, days. It was his last day on this planet Wednesday. After close to 15 years of embedding vivid memories in our minds. Like the sight of his little tail, sticking straight up, the only visible sign of him as he waded through a sea of wrapping paper and packing peanuts from our wedding presents. Or the way he would headbutt your arm or leg to let you know he needed your undivided attention now. His very vocal intolerance for travel. How he used a pile of laundry to cope with moving from our old house to our current home. Those familiar smells somehow centered him. His uncanny ability to sense when company was about to leave, to the point of when we’d close and lock the door we were conditioned to look to the floor as we turned around so we wouldn’t step on his silent sitting figure right behind us. 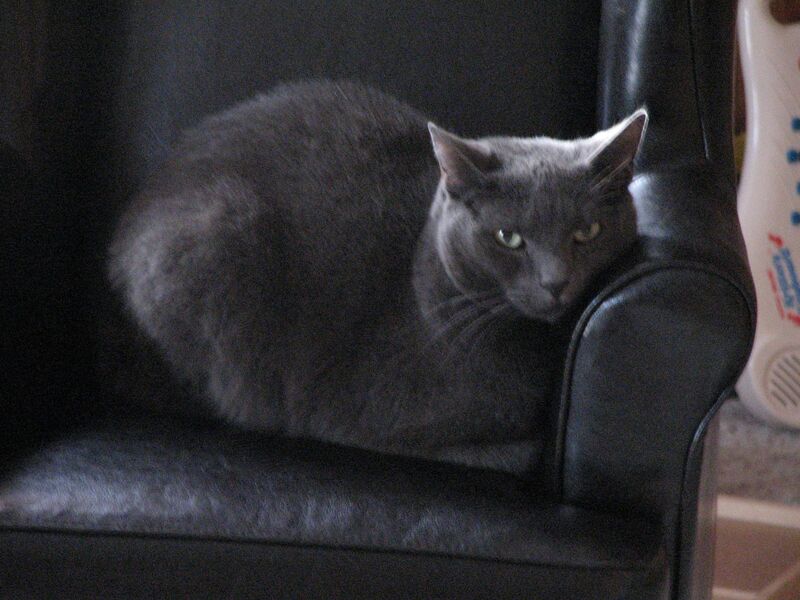 He would grudgingly get along with a kitten we introduced to the household when he was five years old. And after a couple weeks of power-pouting, accepted our firstborn with a little cat-bath on the top of our infant’s bald head. Aging was a verb he tackled with as much grace as he could, but the past year was a hard one for him. He grew codgerly, needed insulin, and was forced to adopt a low-carb diet. Despite these changes, he kept up a brave front. Even as aging and health progressed to the point where some of life’s most basic functions were no longer controlled by him. That’s how we found ourselves bringing the pet carrier down from the attic one last time for him. Why we added an extra towel, to help guard against the wintry chill outside (even though we knew it would need to be laundered aggressively later). Quietly entering a room with walls almost the same color as the foster home spare room we first met him in. Stroking his silky fur from the top of his head, curling around the bases of his ears, scratching under his chin and trailing our fingers gently over haunches that grew more pronounced over the past few months. Loving him as best as we could as he left us to find a much better, pain-free, place. There will never be another cat like him. He was so sweet and had such personality he will be missed by Dan and I. I know how hard it is to make the decision but I am blessed he had such a loving family.